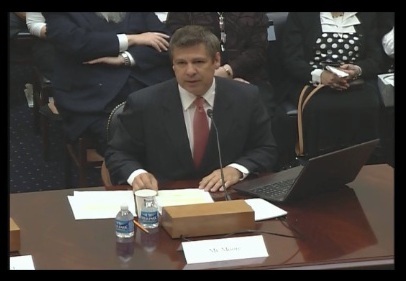 Last week, I was called to testify before the congressional House Foreign Affairs Committee, Human Rights Subcommittee. My appearance was at the request of the subcommittee chairman, Congressman Chris Smith of New Jersey. The hearing was called to investigate the illegal arrest and imprisonment of American Jacob Ostreicher, and the inaction of the United States government (read “State Department”) on the case. As I said in my testimony on Wednesday, June 6, (appended to this article, below), Jacob is essentially a political prisoner accused of a crime which never happened. Not only can the government of Bolivia not provide a single iota of proof that Jacob Ostreicher committed a crime, they cannot provide a single iota of proof that a crime was even committed. Yet Jacob remains in a squalid, dangerous prison; one run by the inmates themselves. (See my blog, “Three Days in Hell,” 4/17/2012). He must pay to have a cell, he must pay to eat, and he must pay protection money to stay alive. The judges and prosecutors in the country are puppets of Evo Morales and must toe the line or risk prison themselves. The defense lawyers, in turn, are many times puppets of the prosecutors. In fact, in the very prison in which Jacob is being held hostage, there is a special wing just for prosecutors, lawyers and judges. The inference is inescapable: “Play ball” or join the person whose innocence you are championing. Either way, the innocent arrestee has no chance of release. 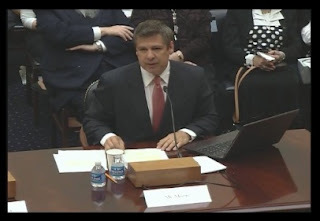 During the Foreign Affairs hearing on the 6th, Congressman Smith voiced his interest in attending a scheduled legal hearing for Jacob in Bolivia, yesterday, June 11, 2012. I cautioned him, though, that I felt that there was exactly “zero” chance of the hearing taking place. Only once has a hearing for Jacob gone forward, and in that hearing months ago, Jacob was ordered released on bail. Before he could even muster out of the prison, the judge reversed himself sheepishly, in wording that sounded oddly like a person speaking with a gun to their head. In fact, the judge criticized himself for putting “..too much emphasis on evidence presented to him.” That’s a nearly verbatim translation. Since that date, no hearing has taken place, though many have been scheduled. Yet Rep. Chris Smith of New Jersey was on a plane in less than 48 hours. It was an act that provided the only ray of hope in a dark tragedy. Jacob’s defense attorneys strenuously objected to the postponement, and the judge, between a rock and a hard place, finally agreed to hold the hearing at 3:30 pm, which incensed the prosecutor. At 3:30, when the hearing reconvened, the Minister of Government, (MOG) (not the Minister of Justice), ordered the judge to recuse himself from the case, apparently because his ruling that the hearing should take place showed favoritism to Jacob. The judge refused. The MOG then threatened the judge with prosecution if he did not recuse himself from the case. Even in a judicial world with little pretense of propriety, this threat was blatant. The judge, instead of recusing himself, sent the matter up to the Supreme Court to decide—in effect cancelling the hearing. This appeal will result in yet another delay of months before the next hearing. If this judge recuses himself or is forced out, he will be at least the third judge removed from the case. Tragically, this whole charade is simply a shell-game to keep Jacob in a prison they are betting he will not survive. One must seriously consider whether the aim of the Bolivian government is to ensure that there is no Jacob for whom a congressman would fight. I must preface this section of the article by saying that I believe that the State Department is one of the most essential organizations in the United States government, and it is staffed by and large, by honorable, brave and caring people. I hope that the situation with Jacob Ostreicher is an anomaly caused by nonsensical State Department policies, but I fear that it is much more than that. By using the hearing sham, the Bolivians have checked the right boxes with a risk-averse U.S. State Department (see my testimony below), allowing them the cover of allowing the Bolivian “judicial process” to run its course. Amazingly, the State Department’s written evaluation of the Bolivian “justice” system is a scathing indictment of political retribution and corruption. Specifically, according to the 2011 State Department “Country Report on Human Rights Practices,” Bolivia’s “justice” system engaged in “arbitrary or unlawful deprivation of life (murder),” “arbitrary arrest or detention,” and “denial of a fair and public trial.” These are not my words, these are the words of the U.S. State Department. But now that an American is being victimized by these exact human rights issues, the Bolivian judicial system is legitimate. The State Department finds it a compelling argument that the Bolivian justice system should be allowed to continue in Jacob’s case without intervention. Not once has the Charges d’Affaires John Creamer, chief U.S. diplomat in Bolivia, visited Jacob in prison. Not once. This is a strong message of ambivalence to the Bolivians. Not once has a meeting with the Bolivian government been called to discuss the plight of Jacob. He has allegedly been mentioned, but only during meetings previously scheduled for other topics. Kind of a diplomatic, “Oh, by the way….” Again, a strong message, but the wrong one. Not once has any staffer at the U.S. Embassy in Bolivia uttered the name Jacob Ostreicher in a public forum. In fact, if one had only the State Department to provide information on justice for Americans overseas, no one would ever have heard of Jacob Ostreicher. Not once has the embassy contacted Jacob’s family unless they are replying to a call from the family or providing information promised during that call. Not once has the U.S. State Department unilaterally reached out to Jacob’s family. Not once. One would think that the State Department would consider Jacob’s plight a serious matter. If not Jacob’s plight, one would think that they would like to set the record straight and avoid criticism they might consider baseless. However, the State Department immediately declined to appear. 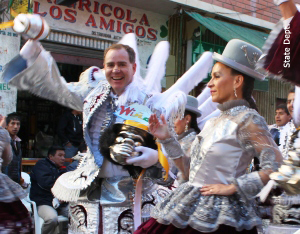 Yet, four days later, and exactly four days before the hearing, Charges d’Affaires John Creamer made time to dance in Bolivian native costume in a Bolivian festival. El Deber, the main newspaper in Bolivia, explained that in order to learn the dance, Creamer had to take lessons four times each week for over a month. A total of 16 dance lessons before he donned the costume of the country illegally holding an American citizen fighting for his life in a squalid prison. A very busy man indeed. All this while Jacob continued a hunger strike. As Jacob told me recently, the hunger strike is as much in protest of how the U.S. State Department is ignoring him as it is of his illegal detention by the Bolivians. Charges d’Affaires John Creamer and wife, June 2, 2012, the 48th day of Jacob Ostreicher’s prison hunger strike. The above photograph of Mr. Creamer and his lovely wife Liza dancing in Bolivian costume was proudly posted on the embassy website two days before the Foreign Affairs hearing which they refused to attend. A thorough search of the U.S. Embassy Bolivia revealed no mention of “Jacob Ostreicher.” A website search engine query answered “no results” for Jacob’s name. The U.S. State Department is completely aware of the corruption and use of the “judicial” system in Bolivia for political purposes. (Yet, they apparently believe it is good enough for an accused American.) The State Department knows for many reasons, not the least of which are the events of May 30, 2012, 8 days prior to the hearing. On that day, Roger Pinto Molina, a prominent Bolivian Senator took refuge in the Brazilian Embassy in La Paz, requesting political asylum and protection from Evo Morales and his government. Molina has accused the Morales government of human rights abuses, drug trafficking, the incarceration of political prisoners and corruption. In response, the Morales “Justice” Ministry has charged Molina with a series of crimes, including political corruption. Molina told the Brazilian Embassy diplomats that he feared for his life. Bolivian Vice President Alvaro Garcia linera said on June 6, the day of the U.S. congressional hearing, that Molina was not being persecuted, and that there were no political prisoners in Bolivia. The vice president also said, “If he believes that….he didn’t commit these crimes, well, he should be happy to defend himself” in court. Molina is apparently aware of an accused person’s prospects of a fair trial (or any trial) in Bolivia. Apparently, Brazil, which shares a border with Bolivia agrees. Yesterday, June 11, the Brazilian government granted Senator Molina political asylum. Senator Molina knew better than to stay in Bolivia, and it appears that he knew better than to seek sanctuary at the U.S. Embassy. Jacob, unfortunately did not have the same information Molina had. Jacob was too trusting. Of both the Bolivians and the Americans.